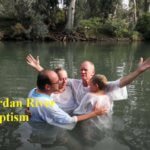 Heavenly International Tours is one of its kind and a leading tour operator for Israel – the Holy Land, known for our in-depth knowledge of the destination. As such, we are the only tour operator company in South Africa that offer our participants “the little extra” of sits in Israel that not many have visited. 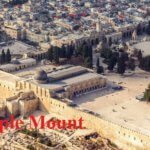 This day-tour suites groups that visited Israel many times and are looking for more interesting sites. A new piece of evidence is reigniting controversy over the potential bones of Jesus’s family. A bone box inscribed with the phrase “James, son of Joseph, brother of Jesus” is potentially linked to a tomb in Talpiot, Israel, where the bones of people with the names of Jesus’ family members are buried, according to a new chemical analysis. 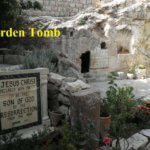 Aryeh Shimron, the geologist who conducted the study, claims that because it is so unlikely that this group of biblical names would be found together by chance, the new results suggest the tomb once held the bones of Jesus. Historians place Jesus’ birth at some time before 4 B.C. in Nazareth, a small village in Galilee. “If this is correct, that strengthens the case for the Talpiot or Jesus Family Tomb being indeed the tomb of Jesus of Nazareth,” said Shimron, a retired geologist who has studied several archaeological sites in Israel. An exciting find in Jerusalem of a unique stone inscription dating to the Second Temple Period around the time of Herod the Great’s rule, mentioning the word “Jerusalem” in Hebrew letters, and using the same spelling as we know it today. The inscription reads: Hananiah son of Dodalos of Jerusalem. The stone will be displayed at the Israel Museum, During excavations, the foundations of a Roman structure were exposed, which were supported by columns. The stone column drum, reused in the Roman structure with Aramaic inscription appears, written in Hebrew letters typical of the Second Temple Period. The walls surrounding the old city were built by the Otoman’s Suleiman the Magnificent around 450 years ago. 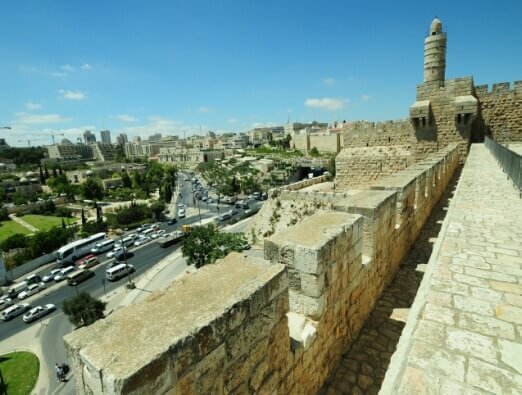 Walking on the walls allows us to have a glimpse of the old and new Jerusalem. Beautiful views of the entire area. We start the walk from Jaffa Gate where the road to Jaffa began. The walking route takes us to the north until Lions gate and to the south up to Dung Gate. Along the North walk we can see the Christian quarter, Holy Sepulcher Church, Via Dolorosa, the buzzing Oriental Bazaar, The walk ends by Lions gate from where we can continue to the Roman Square. Along the South Walk we can see The David Citadel and King David street, the Jewish Quarter, Shaa’nanim first suburb outside the walls (first settlers were paid to move in !). Continue above the Armenian Quarter to Zion Gate over looking Mount Zion. Underneath the old city is hidden a fascinating big and beautiful cave, also called Tzidkiahu Cave, one of the interesting sites. 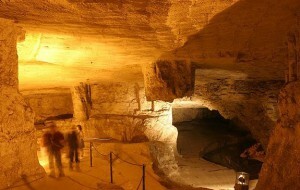 The cave which is 225 m in length, was used as an old quarry. Here used to be quarried the Jerusalem stone used in public buildings and houses of the rich. It is believed that this quarry started during times of the 1st Temple.Josephus Flavius called it the “Kings Cave”. Also during the 20th century, stones were used for the Clock Tower above Jaffa Gate, destroyed during the British mandate. This is also belived to be the cave that Tzidkiyahu, king of Judeah hid and escaped Jerusalem to Jericho. Since the Roman Empire rule, Shechem Gate, now called Damascus Gate was the main gate to Jerusalem. The Otoman gate still stands today and underneath it the base for the Roman’s gate and square. The Roman gate was built during the rule of Hadrian (133) with 3 openings. The east opening survived and one can enter through it to the Roman Square with its original brick stones. Above it is a 22m pillar a point from where they used to measure distances to other cities in Israel. In front of this gate stood a Roman victory column topped with the Emperor Hadrian’s image, as seen on the 6th century Madaba Map. This historical detail is preserved in the current gate’s Arabic name, Bab el-Amud, meaning “gate of the column”. Nearby is a museum telling the gate’s story. On the sides of the gate stands 2 watch towers build by large stones. The eastern tower survived and one can go up the original stairs. he palace of the high priest where the Lord Jesus was examined before the Council in Jerusalem, the Sanhedrin, was not only mentioned in the Bible but also became a site for a Christian church to be built, on the Hill of the Upper City. The idea that this is the exact site of the House of Caiaphas is open for debate. Before Christ and during the time of Nehemiah, the high priest resided on the western side of the temple court area. During the time of the Maccabees the high priest resided at the Asmonaean Palace. Josephus makes mention that during the time of Jesus in first century Jerusalem, the house of Ananias (High-priest during the time of Gessius Florus) stood near the Palace of the Asmonaeans, on the eastern part of the Upper City. A Jerusalem family ripping up its living room floor found a staircase lost for 2,000 years, leading to a large ritual bath carved out of bedrock. It took the family some years to call in the authorities and show them the discovery beneath their house, in the Jerusalem neighborhood of Ein Kerem. Throughout the interim, the family blocked off the entrance to the mikveh with wooden doors, and simply continued to live over it. 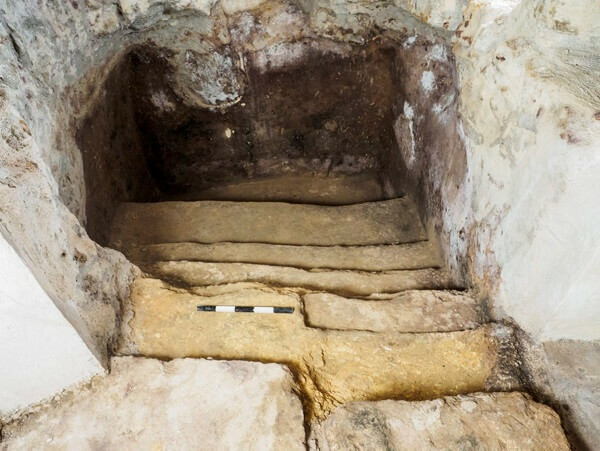 When they did call in the Israel Antiquities Authority, beneath the doors, the archaeologists found the carved stone staircase leaving to a big mikveh, 3.5 meters in length and 2.4 meters wide, with a depth of 1.8 meters. Located in the heart of Jerusalem, the Pontifical Institute of Notre Dame of Jerusalem Center is home to the permanent exhibition of the Holy Shroud. On display since 22 July 2006 in a free exhibit, it has drawn thousands of visitors, especially secular Jews. The linen cloth, which John Paul II described as the ‘mirror of the Gospel’, is presented in a digitally recreated actual-size copy. Panels explaining the historic and scientific research associated with the shroud accompany it. Where the oldest Biblical text found. Ketef Hinnom is an archaeological site southwest of the Old City of Jerusalem, adjacent to St. Andrew’s Church, now on the grounds of the Menachem Begin Heritage Center. It is located where the Valley of Rephaim and the Valley of Hinnom meet, on the old road from Jerusalem to Bethlehem. The site consists of a series of rock-hewn burial chambers based on natural caverns. In 1979 two tiny silver scrolls, inscribed with portions of the well-known apotropaic Priestly Blessing from the Book of Numbers and apparently once used as amulets, were found in one of the burial chambers. The delicate process of unrolling the scrolls while developing a method that would prevent them from disintegrating took three years. They contain what may be the oldest surviving texts from the Hebrew Bible, dating from around 700-650 BCE. Ramat Rahel is located on a hilltop about halfway between the Old City of Jerusalem and Bethlehem. Excavations carried out between 1959 and 1962 uncovered remains of several successive periods of occupation. The most important are those of a large citadel and a magnificent palace of the kings of Judah, dated to the 8th-7th centuries BCE. The site was identified by the excavator as biblical Beit Hakerem (House of the Vineyard), one of the places from which warning fire signals were sent to Jerusalem at the end of the First Temple period. (Jeremiah 6:1). The Biblical Period – During the 8th century BCE, a royal citadel was built here by one of the kings of Judah. Of this citadel only a small section of a casemate wall (a double fortification wall with compartments), remained. But more than a hundred seal impressions of the lamelekh (Hebrew, to the King) type, stamped on handles of storage jars, were found and are associated with the early days of this citadel. They are indicative of the site’s importance as an administrative center of the Kingdom of Judah.